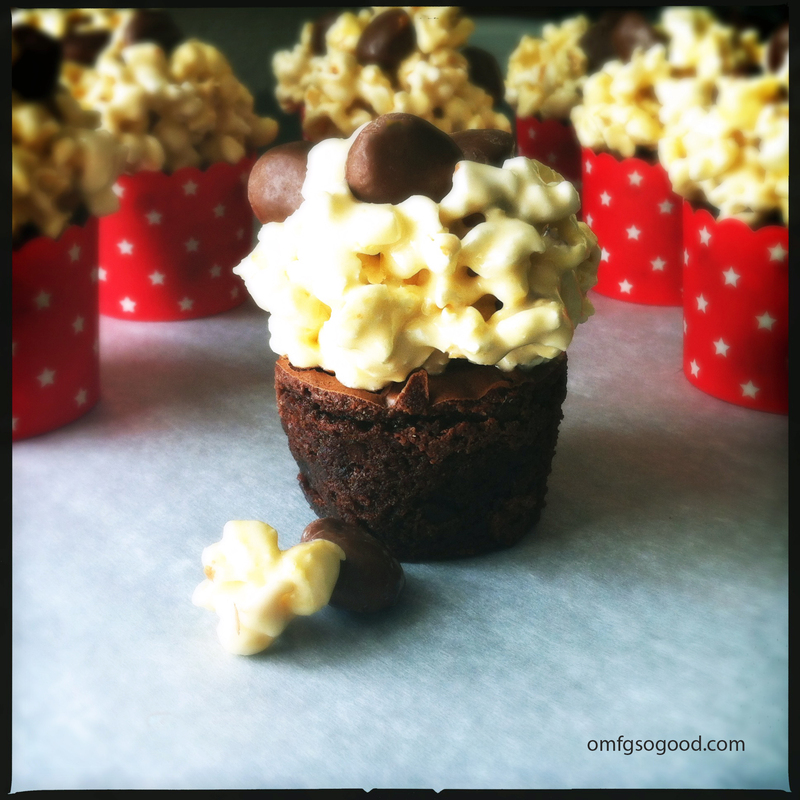 movie night brownie cups | omfg. so good. There’s nothing like waking up with a craving for something that you just can’t shake. It doesn’t happen to me very often, but when it does nothing will stop me from bringing the dream to life. I must have been dreaming about going to the movies. Which as it turns out, is not much more than a dream now that Chonky (Charley) is mobile. Until around two months ago we could get away with hitting a matinee showing of Brave, or even Madagascar 3,142 if we were really desperate for a kid-friendly break from the Arizona heat. Not anymore. Holy crap. I recently tried taking Finley (Picky Eater) to see Paranorman thankfully Baby Daddy tagged along because 15 minutes into the show Chonky struggled free of my iron-grip and tried taking off down the aisle swinging his arms and howling like a zombie gorilla. Never before have I scrambled so fast… scooping him up, grabbing the diaper bag, giving Jonny the ‘you take care of Finley, I’m outta here’ look, and heading next door to wander the aisles of Target to impulse shop for the next hour and fifteen minutes. Amazing the damage that can be done in that amount of time when you’ve got an empty cart and no actual shopping goals. Anyway, back to the dream. So, I woke up with nothing else in mind but popcorn mixed with Milk Duds. Which eventually led to brownies topped with popcorn mixed with Milk Duds. 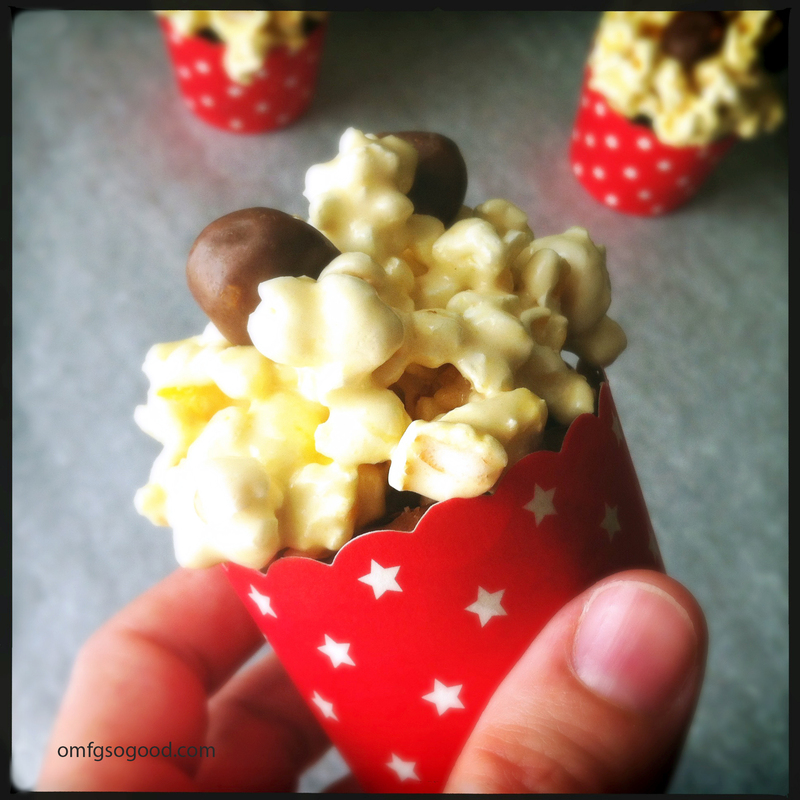 Finley and I were planning an in-house movie night after Charley went to bed, so it was the perfect opportunity to make it extra special (and use the little baking cups that look like fancy popcorn tubs that have been taking up space in the cupboard for months.) Win. Win. 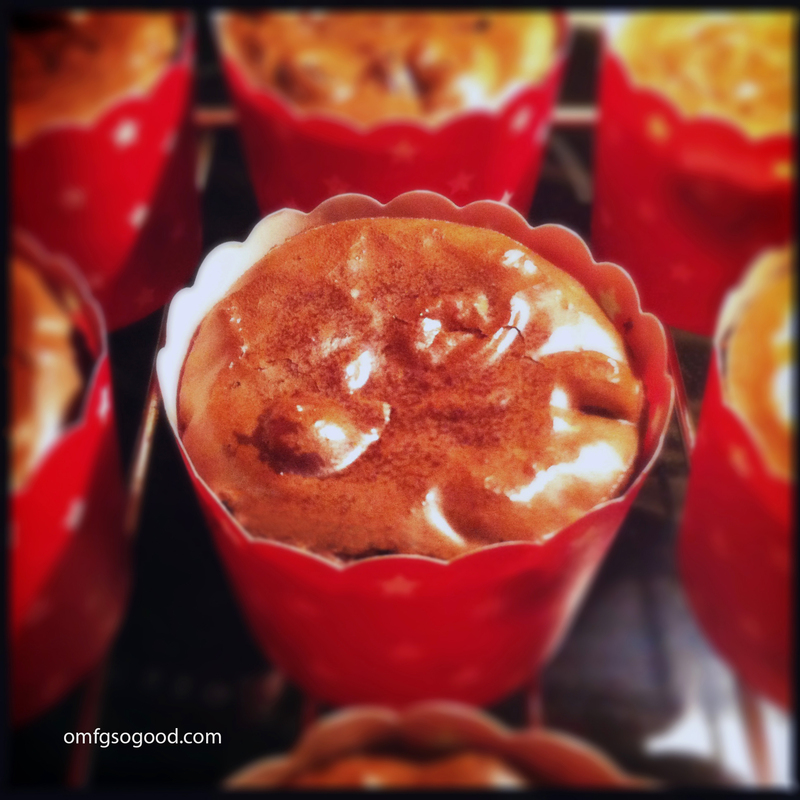 Line a cupcake pan with paper liners and set aside. Prepare the brownies according to the instructions on the box and spoon evenly into the prepared cupcake tin then bake according to package directions. Remove from oven and allow to cool completely on a wire rack. Pop the popcorn according to package directions and set aside. In a medium saucepan, melt the butter then add the brown sugar and stir to melt completely. Add in the marshmallows and continue stirring until melted and smooth. Add in the popcorn and toss to cover evenly. Remove from the heat and let cool for a few minutes. 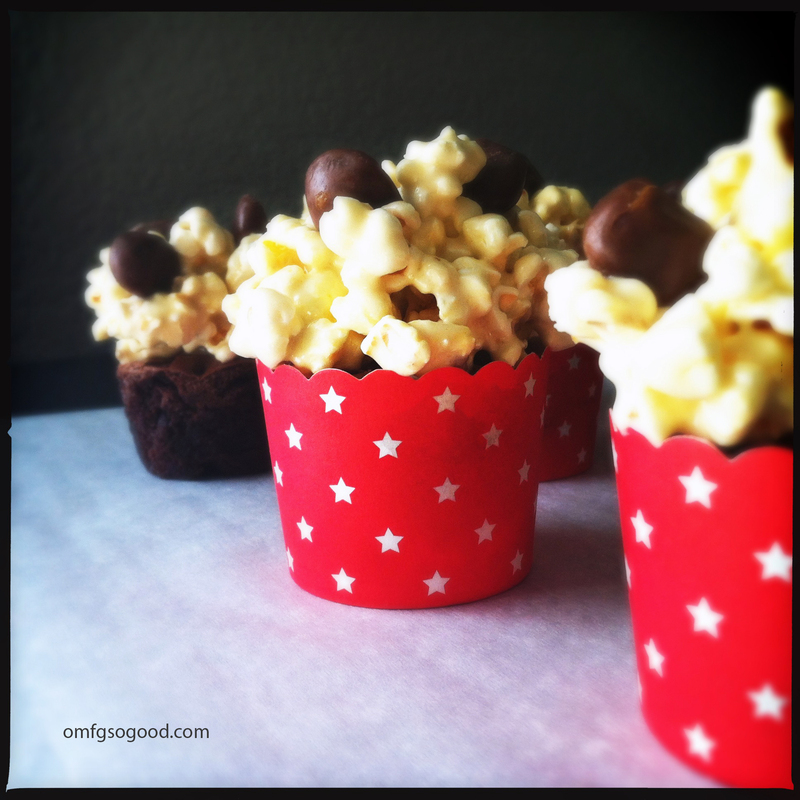 Grease your hands with a small amount of butter, then form small (2″) popcorn balls and gently press into the top of the brownie cups. Top with 3 – 4 Milk Duds. Really easy. Really cute. Really yummy. 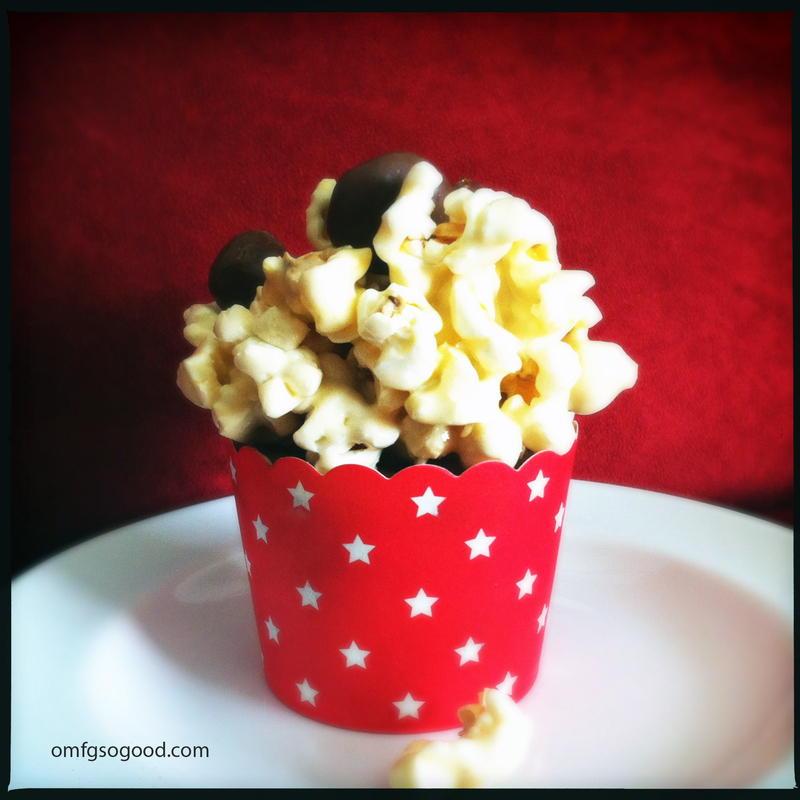 Finley and I had a fantastic time watching The Tigger Movie (twice) and munching on popcorn brownies. Every kid’s dream for a Monday evening. And yeah, it was pretty nice for me too.